Since the debut of the Pop-Up Art Spot in 2013, this roaming activity cart has become a favorite stop for visitors of all ages. In a continued effort to make immersive activities that are inspired by nearby works of art, the Center for Creative Connections team has introduced a brand new Pop-Up Art Spot cart designed around special exhibitions. Our first focus is The Power of Gold: Asante Royal Regalia from Ghana, which features over 250 objects revealing the splendor of Asante regalia from the 19th to 21st centuries. The Power of Gold Pop-Up Art Spot will rotate monthly between two carts of activities until the exhibition closes on August 12, 2018. At the April Late Night, visitors learned about proverbs connected to selected goldweights in the exhibition by playing a match game and making drawings. In May the cart will focus on textiles. Visitors will observe the detailed patterns in kente cloth and use silk thread to create their own weaving. They can also explore the symbols in adinkra cloth and create a rubbing using various adinkra stamps. Come try these activities, and more, in the Power of Gold exhibition on Saturdays from 1:00 to 4:00 p.m. and on selected Late Nights from 8:00 to 10:30 p.m. A special exhibition ticket is required. Kerry Butcher is the Education Coordinator for the Center for Creative Connections at the DMA. Hi, my name is Abigail Hofbauer– intern, chocolate lab puppy aficionado, sushi-lover, and new Dallasite. I’m currently in graduate school at Baylor University for my Masters of Arts in Museum Studies, having just completed my Bachelor’s (also at Baylor!) in History. This summer, I had the chance to intern with the Center for Creative Connections at the DMA. I worked on many things over the summer: daily C3 upkeep, interactions with volunteers, and the newest Visiting Artist Project. Lisa Huffaker’s Sound re:Vision opened my eyes to the hard work behind the scenes of all interactive art installations. It was fun to create zines and to have part ownership of such an interesting piece in the Museum. As the C3 Summer Intern, my specific project was to observe and evaluate the visitor experience of the Pop-up Art Spot inspired by the Keir Collection of Islamic Art. 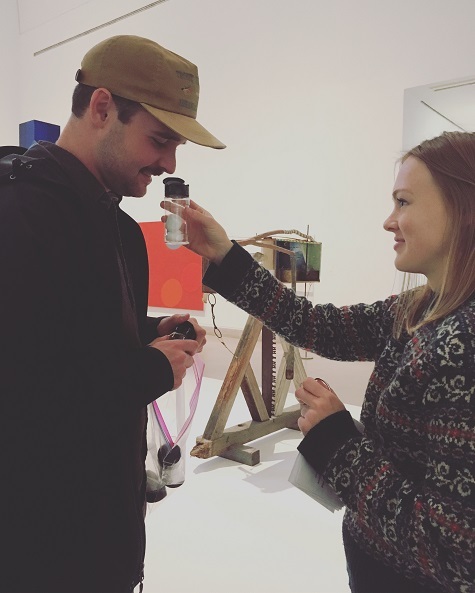 Through surveys, personal interactions, and simple observations, visitors provided some detailed feedback about what they want in a “pop-up experience” at a museum. Our goal was to make sure visitors were spending time with the art collections, making connections with the art and others in their group, and having fun in the Museum! If the results of my observations are any indicator, I’d say that we reached our goal. Most of the visitors came in groups – both families and adults. Almost all of these groups spent time in the Keir Collection of Islamic Art either before, during, or after their activity. It was important to confirm this and show the Pop-up Art Spot was making a connection between the art and visitors. The majority of the visitors who participated in the Pop-up Art Spot activities were also adults, rather than children. This was a great piece of information to glean, as it shows how diverse yet simple activities appeal to all ages. Teens and adults above age 45 are some audiences to focus on in future activities. The coloring and shape search activities were very popular, but the cross-cultural connection postcard activity really touched the hearts of our visitors. Some responses were so heartfelt and interesting! 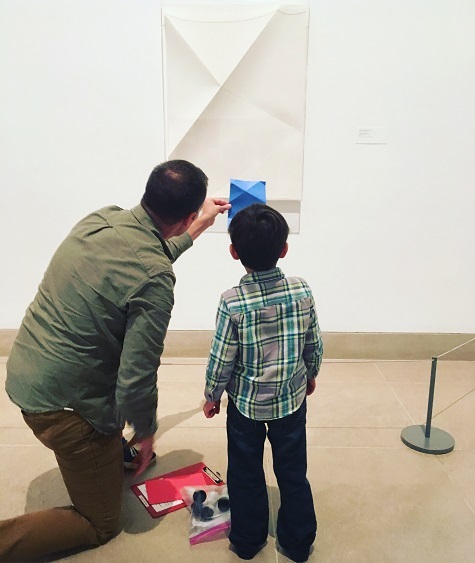 In the surveys taken, visitors indicated that they felt connected, proud, inspired, and excited to spend time with art. Many also indicated that there was a larger social impact of the activities on their visit: some learned about shapes, colors, patterns, or other visitors! We had 73 activities filled out and 183 participants throughout the month of July. Overall, this project was so fulfilling! I got firsthand knowledge of the visitors at the DMA. I also got to work closely with some amazing volunteers and see how they help educational programs shine. But most important of all, I used skills I learned from classes and previous experience to improve museum programming. This internship has allowed me to be part of so many experiences at the DMA and learn from the amazing Education team. It’s been an honor and I couldn’t have been happier to be here for the summer! Think back to your favorite scene in a movie. Was it action packed? Romantic? Full of suspense? Chances are that the music—the film’s score—helped create the mood of the scene. Now think about your favorite work of art. How would you describe its mood or feeling? 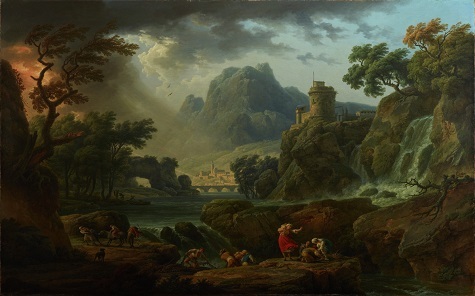 How did the artist convey that mood? When we describe the mood of a work of art, we typically think about visual elements like color, the quality of the brushstrokes, and composition. But sometimes, even with a work of art, music can enhance your experience. We recently paired up with two local musicians, Clint Niosi and Claire Hecko, and invited them to imagine one minute “film scores” for a handful of works of art in the 18th Century European Gallery. Meet the musicians, learn about their process, and hear a sample of their work below. Tell us about yourselves-in 50 words or less. Clint Niosi: I’m a songwriter, film score composer, and audio engineer from Fort Worth. I also work as a Digital Technology Specialist for the Art + Art History Department at UT Arlington. Claire Hecko: INFP, musician, composer, picture maker, seamstress, cat lover and motorcycle enthusiast, among other things. My primary instruments are viola and bass. I like long walks in the desert and good manners. How would you describe your process of creating a “score” for a work of art? Clint Niosi: While I wasn’t really sure how to approach it initially, I ended up using basically the same process I would have used for a film score. I try to find the emotional core of the scene and use the music to help move the story forward. Once I feel like I’ve found the mood I add or take away layers until it feels right with the picture. Claire Hecko: I have very little education in music theory, so I’m not entirely sure how to best describe my process. I consider the feelings I want to embody in a piece and try to determine how to best represent them musically. Often, this entails picking up an instrument and just playing around on it until I come up with something that will serve as a foundation for the piece. From there, I begin adding layers to build a complete composition. Clint Niosi: Yes there were. Creating a modern composition outside the historical milieu in which the paintings are set seemed very daunting. Also, the limited duration of the format (one minute per piece) was an additional challenge. Some of the paintings have very complex stories and complicated emotions to convey. Ultimately I just dove in and had fun with it. 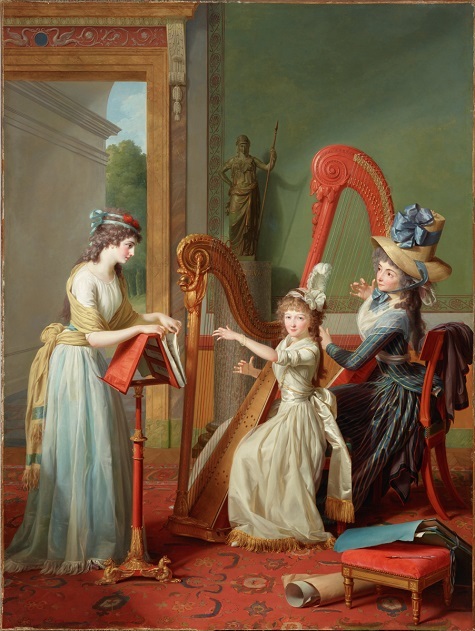 Claire Hecko: My biggest challenge was creating the “score” for The Harp Lesson by Jean Antoine Theodore Giroust – I had many ideas, but no access to (or training to play) a harp. Thankfully, technology allowed me to replicate the sound of a harp on a laptop. What did you enjoy most about this opportunity? Clint Niosi: It was such a treat to have a chance to collaborate with the DMA. I’m an art enthusiast and a long time fan of the DMA’s permanent collection. The chance to dive into something like this is something I will always remember. It was a learning experience. Claire Hecko: My degree is in Art History, a subject close to my heart. The opportunity to represent a work of art through music was very exciting for me! Stop by the Pop-Up Art Spot this Saturday to check out an iPod and listen to the “film scores” composed and recorded by Clint Niosi and Claire Hecko. 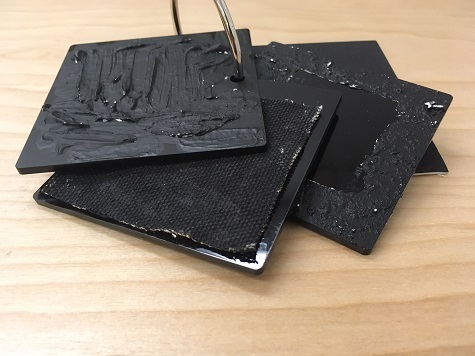 Stop by the Pop-Up Art Spot on Saturdays between 1:00 and 4:00 p.m. or on Late Night between 8:00 and 11:00 p.m., check out an iPod, and listen to these mesmerizing sounds as you look closely at these works of art. Jessica Fuentes is the Manager of Gallery Interpretation and the Center for Creative Connections at the DMA. 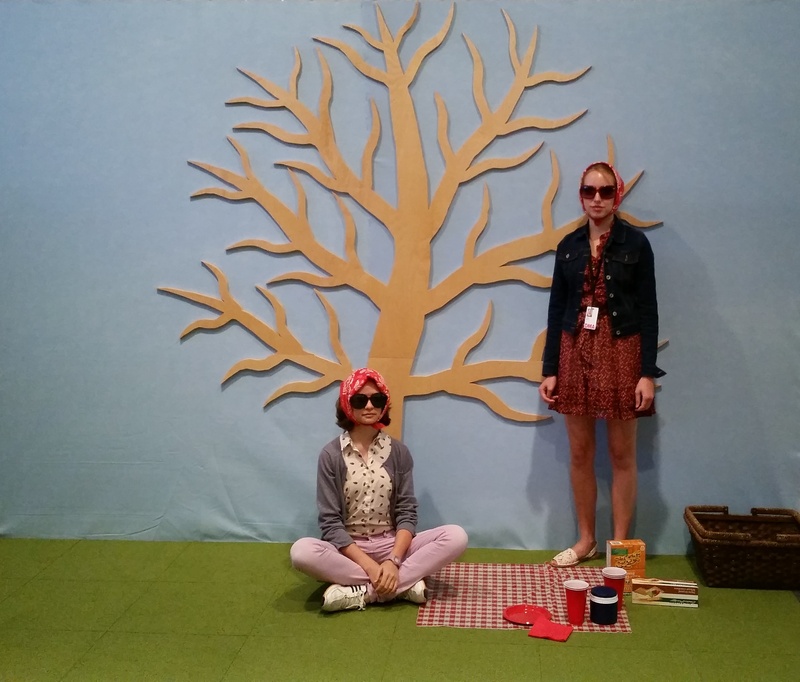 Recently, the DMA’s Center for Creative Connections team and our Manager of Access Programs, Emily Wiskera, put their heads together to develop a new Pop-Up Art Spot with sensory-based activities. On Saturdays in December, pop in to the Museum to see Passages in Modern Art: 1946-1996 for FREE in the Barrel Vault Gallery on Level 1 and enhance your art experience. With these Sensory Squares, you can explore what works of art might feel like if we were allowed to touch them. 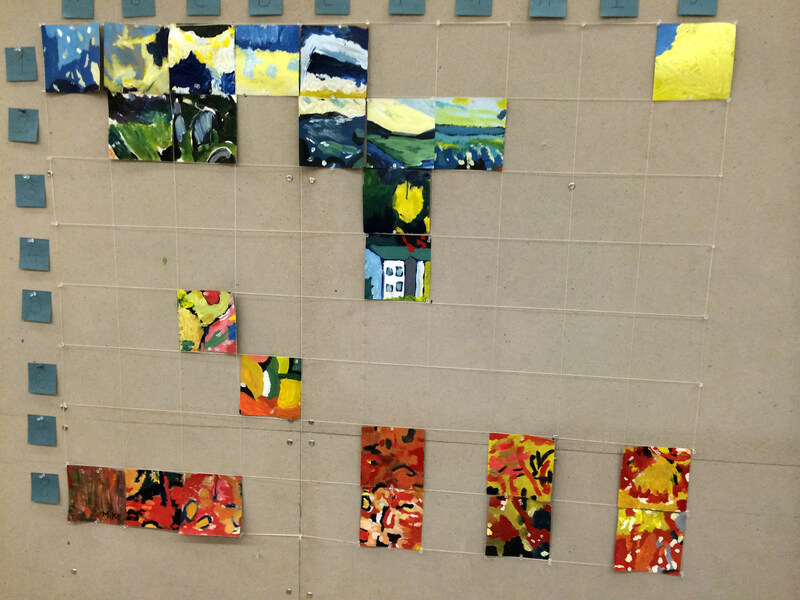 Look at nearby works of art as you feel each square and consider which works you think relate to each texture. Check out a bag of scent bottles and a ring of art cards. Sample the scents and reflect on what memories or images come to mind when you smell them. Find each work of art on the cards provided and compare the scents to the artwork. Which scents do you connect with each work of art? Interested in origami? Pick up a piece of paper and try your hand at figuring out the folds Dorothea Rockburne made to create the form in Locus Series #6. The Center for Creative Connections (C3) staff was fortunate to receive help from two high school students this summer. Sophie Anthony, a rising senior at Booker T. Washington High School for the Performing and Visual Arts, spent eight weeks working with us through the Mayor’s Intern Fellows Program. Chloe Barreau will be a junior at the Chinese International School in Hong Kong. She worked with C3 during a month-long visit with family. Below are some of their experiences from this summer. Wow. I did not realize how fast eight weeks would fly by. My internship at the DMA has been amazing — art-filled and action-packed. Through the Mayor’s Intern Fellows Program, I got a behind-the-scenes peek into the day-to-day running of the biggest (and still expanding) art museum in town. What a thrill! As a high school art student, it was exciting just to be in the same building as some of the beautiful and breathtaking masterpieces housed in the Museum, not to mention the opportunity to enhance visitors’ experience with these works. 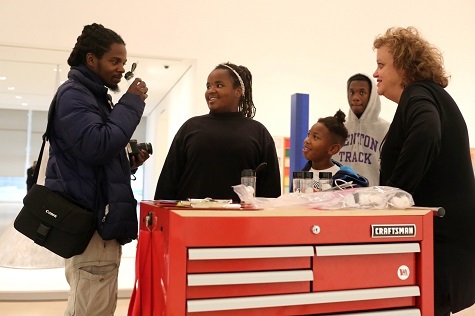 Working with visitors in C3 and behind the scenes gave me the chance to assist and interact with regular art patrons and newcomers alike, as well as see firsthand the DMA’s commitment to art education and visitor participation. A lot of my time spent as a C3 intern was, of course, spent in C3! C3 is a hotspot for most Museum visitors — nearly everyone who enters is excited by the relaxed and hands-on atmosphere, and leaves with their own Art Spot creation. An extension of the C3 atmosphere is the Pop-up Art Spot, a cart filled with activities that moves through the galleries on a weekly basis. It allows museum-goers a chance to participate with works of art more closely and see things they might not have noticed before. Both C3 and the Pop-up Art Spot were a lot of fun because I was able to chat with visitors and learn their thoughts and perceptions on art pieces and the DMA. I met people who had been going to the DMA for the past twenty years and people who had never visited an art museum before. But it wasn’t all conversations — there are always plenty of supplies to be prepped! One of my favorite projects was the July Late Night Creations activity, the “Curious Case of the Mystery Painting.” Chloe and I made and designed the materials for the activity and wrote (not to mention re-wrote) the instructions for this mystery-themed collaborative art project. 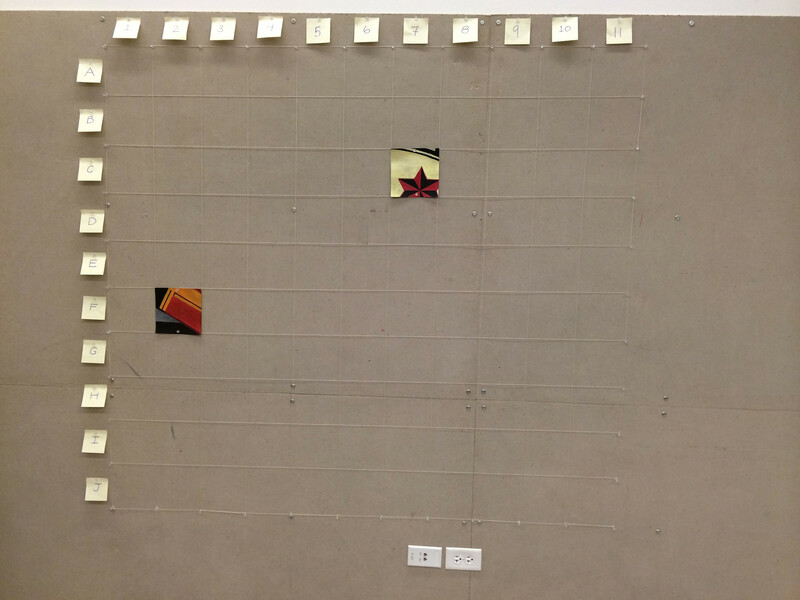 We chose the two “mystery” paintings that would be recreated and then, after much multiplication, we gridded out the artworks into two-inch squares, which would be “clues” that participants would recreate on bigger pieces of cardboard. Slowly, piece of cardboard by piece of cardboard, the paintings would be revealed. The hardest part of creating this project was writing the instructions. Chloe and I quickly learned the value of one word instead of two, realizing that the shorter and more concise, the better. We wrote and rewrote numerous drafts until we eliminated all extraneous details and arrived at the instructions used during Late Night Creations. When I came to work the next day and saw the final masterpieces, I was astounded. The visitors did an amazing job in recreating the mystery paintings! Below are the activity instructions; scroll down to see the activity in progress and completed. All too quickly these past eight weeks have sped by. I can’t believe how much I’ve learned, how much I’ve seen, how much I’ve done here at the DMA. My experiences have been widely varied—I now know both how to write a set of instructions for a community art project and the most efficient way of cutting cardboard for the Art Spot. I helped individuals with Alzheimer’s discuss pieces of art in Meaningful Moments and went behind the scenes to see exhibits go up and come down. I became an old pro at screenprinting T-shirts through assisting with the Design Studio summer art camp and listened as teens made soundscapes based on The Museum is History exhibition during a UA Maker Club workshop. I am so appreciative and thankful for my internship—the DMA, specifically C3, gave me a wide and varied experience in a field of work I would love to pursue. I learned so much this summer and I’m looking forward to volunteering in C3 soon! My internship experience at the DMA this summer has taught me so much about different ways in which we can enhance our appreciation of art. I first spent two weeks assisting the New World Kids 2 summer art camp. The classes encouraged children to create art books and stop-motion clips as well as develop back stories behind why their characters lived where they lived and the motivations behind what their characters were doing. It was exciting for me to see how the program inspired children to construct elaborate plots and plan out each scene as if they were budding directors or playwrights. I believe that walking children through the process of creating a story is an effective way to introduce them to the appreciation of art. In thinking about how they would design film sets, direct the acting, and develop the characters and sub-plots, children open their minds to a wider breadth in their interpretation of art. All great artworks have a background story, a history to the subject matter, and a thought process behind the composition. This was illustrated in the European gallery, where I had the chance to admire the art alongside our visitors, thanks to the new Pop-up Art Spot. There, visitors have fun dressing up in costumes, making gesture drawings and writing dialogues for characters using magnetic words. Each painting presents a narrative, and the visitors participate in this narrative by coordinating their facial expressions, clothing, body pose, and setting with the artwork’s composition. At this Pop-up Art Spot, I saw how these activities enlivened the experience of visitors viewing the art pieces and inspired them to imagine the story behind the art. I see that art is not only to be admired, but to be experienced in full immersion. We are not only audiences, but participants. Speaking of participation in art – at July’s Late Night, Sophie and I were excited to see visitors’ reception to the “Curious Case of the Mysterious Painting” activity we worked on together. 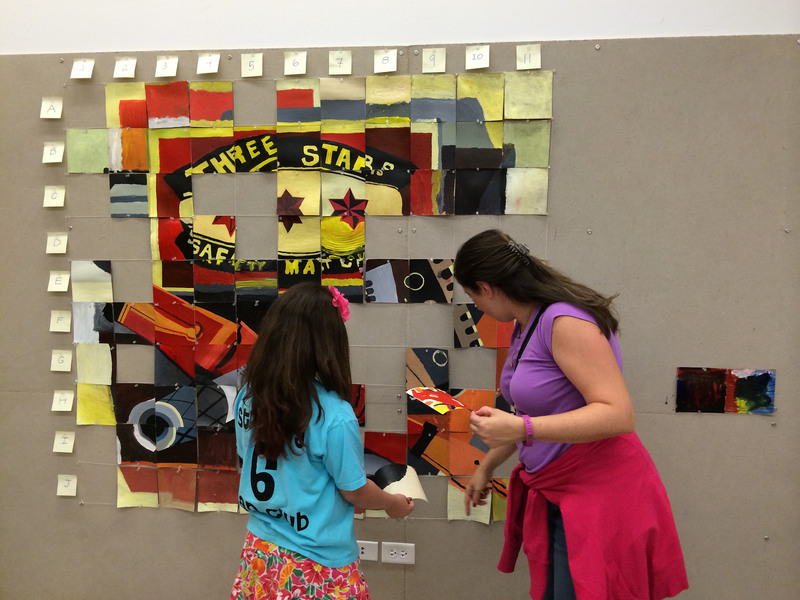 We were thrilled that people enthusiastically lined up for their turn to contribute a clue by taking a section of an artwork poster and enlarging it on a piece of cardboard using paint. The next day I saw the mystery artworks that were recreated with the public’s contribution – the mosaics of the pieces came to life, with a beauty that can only come from a community of “artists” collaborating together for a night! I have discovered that telling a story is core to the purpose of art. An artwork is a mode of communication across time, even across dynasties and cultures, and artists create an extension of themselves and share with us a part of their being. I am really grateful for the opportunity this summer to intern at C3! The department was very welcoming, and the staff took care to educate us while giving us leeway to express ourselves and take initiative. I loved meeting diverse people, from the speakers to the audience and members of the museum – everyday was a pleasure, and I have fond memories of my interactions and experience to bring home with me back to Hong Kong! Thank you, Sophie and Chloe, for your very hard work this summer! We will miss seeing your smiling faces every day.